Get ready to clutch your pearls….my first 100 miler is in 5 weeks and I don’t really have a “training plan” to follow. I mean, I have an overall idea of how I want my training to look….but a plan? Nah. Here’s the deal–after my 50 miler I had an epiphany of sorts. Now don’t get me wrong, I keep up with weekly mileage and vertical gain. In my mind I assess weekly volume and compare my long runs. But I don’t follow a prescribed plan. After my 50 miler I decided to change my approach a bit and I’m really excited about it. My endurance is where it needs to be. I spent months and months building up a nice base. So far this year I have completed a couple of 50K’s and my first 50 miler. Note–this is not my first year of ultrarunning though! I’ve been completing ultras for a couple of years now and I’m slower than molasses… Just to give you an idea of what we’re dealing with. I don’t do crazy amounts of high mileage each week either. I know some people frown upon that, but you gotta do what works for you. For this 100 miler I am choosing to focus now on learning to run better on tired legs. I have been simulating this by lifting heavy again on my lower body and then performing back to back long runs. I will be working on longer back to back runs before I begin to taper for the 100 miler. I’ve also been in the gym doing rowing, cycling and lifting as heavy as I can. Fatiguing my legs and then running on them as much as I can (while still preventing injury) has been my primary goal. So far I feel great! I can tell that I am adjusting to running on tired legs. I recovered within just a few days from my 50 miler and I knew then that my endurance was where I wanted it to be. I just needed to work on fatiguing my legs more and more. I want to start this post by saying I had an amazing race this past Saturday at the Dam Yeti 50 miler in Damascus, Virginia. This race is put on by the Yeti Trail Runners and is such an inclusive, fun and uplifting event! Stats: 50 miles starting at the top of Mount Rogers National Recreation Area along the border of NC/VA …. follows the Virginia Creeper trail down to Damascus, into Abingdon and finishes back in Damascus. A mostly downhill race on beautiful, but non-technical trail. Bottom Line: This race is a fun event that is perfect for your first 50 miler. There’s also a 50K as well! Why did I say this is not your typical race report? Because I want to give you a story about the events that led up to this race for me. This is my first 50 miler and I’m just happy that I was able to finish. It was a long, hard road and I want to give you some insight into what this race meant for me. Because for me, the trail is therapy. It’s Tuesday before race day. I’m frantically chasing my special needs son down the road as he explodes into rage. Despite our best efforts to keep him safe, he is able to break through windows, maneuver through safety locks and alarms and burst out of the house in fits of rage looking for oncoming traffic to run into. It happens in the mere matter of seconds. Yes, this is the life of a child with significant needs. I won’t go into the specifics of his needs, but it is overwhelming to both him and us. My special needs son came to us at age 4 from a history of severe trauma, neglect and abuse. He suffers from the effects of fetal alcohol syndrome and many other disorders. As he becomes older, it is harder and harder to keep him safe. But this day ends happily, he is safe and changes are made to our safety plan. His team of professionals is made aware of the event and we are planning to meet with them first thing in the morning. For now we are staying out of the hospital. But this night, I awake at 2 AM with the most horrible migraine I’ve ever had. I rise out of bed unable to breathe, my heart beating erratically, sweat dripping down my face while I shiver and try to figure out why my chest is in extreme agony. I pace the floor trying to breath… I am overcome with anxiety and panic… I crawl to the bathroom where I vomit and shake in the fetal position on the bathroom floor. This is my reality. Panic attacks that are triggered by the hard days of being a special-needs mom. The next morning I awake and turn back on my “mom mode.” We meet with the doctors for my son, the day goes on and I prepare for my race. Race weekend has arrived and we head off for Virginia. So far, things are fine and to my great relief, we are able to enjoy a nice family trip. The months leading up to the race included a sprained ankle and two episodes of corneal abrasions. Despite my best effort to train, mom duties and injuries littered my journey. But I pressed on and made the best of it. I was just hoping to finish the race and that is all. So on race day I channeled all the emotional and mental strength I had left and remembered that I had to run 50 freaking miles!! My family was there to cheer me on and seeing my special needs son happy gave me just the extra amount of energy I needed. Now for that race report! We arrive for packet pick up and are greeted with a yeti party. The kids were excited to run around and splash in the creek. We then headed back to our hotel in Abingdon to get ready for the long day ahead. This race is a fun one and the first 20 miles are all downhill! Heading down the Virginia creeper trail is gorgeous and you get to cross countless trestles. The trail is non-technical and easy to run, definitely different than what I am used to. 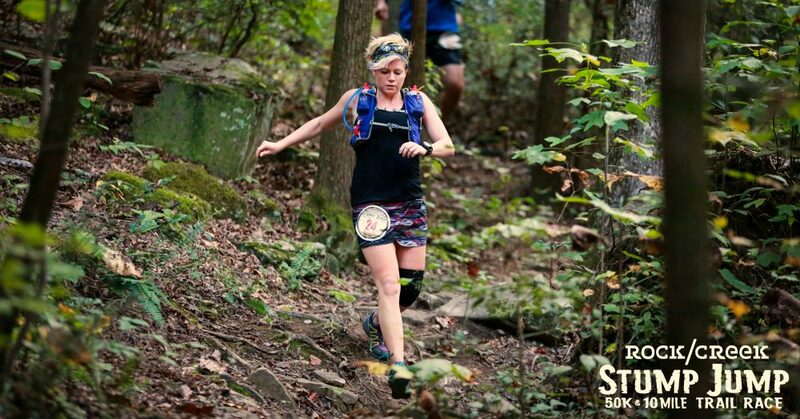 Most of my races involve technical trail and lots of elevation gain. This was a great chance to just enjoy the run and the scenery. I also got to chat with new friends along the way. I was so happy to get to that long awaited finish line in Damascus. By this time my legs were exhausted and screaming at me to stop. But I was all smiles as I get to hug Jason at the finish line and greet my family. After a rough few months of training, I was just in shock that I even finished. But most of all I was so damn proud of myself. I was proud of the strength I was able to gather up inside of me to push on and meet my goals. The stronger I become mentally on the trail, the stronger I am in every day life for my children. So now we are back home, it is about 4 days post-race and I feel great. I hope to take a recovery run tonight. It’s been a stressful few days with one of my kiddos falling off the monkey bars and breaking his arm, and my special needs son having another episode. Working hard to get things straightened out and getting back on track for 100 mile training. Life is tough, but so are you. Here’s to more trail miles and finish lines in the days and months to come! Coming down the mountain during the Dam Yeti 50 … rain, thunderstorms, sweat, a few tears and lots of smiles. Grateful that I get the chance to do this crazy ultrarunning thing. Someday my body will be done…. I want to make sure I have lots of stories to tell, not just things to show. Your body is capable of some amazing stuff. Don’t waste it. My motto this week: rest, sleep, eat!! I’m 4 days out from my first 50 miler. This week I’m refueling my body by focusing on non-running activities (hiking, climbing) and proper nutrition. I took a short run this past weekend and will probably loosen up my legs with another one tomorrow. Tapering doesn’t have to make you crazy if you fill it with other fun activities! And sleep. I can’t overstate the value of true, quality rest. It always makes or breaks my ultra experience. Early to bed each night this week–no partying for this girl! That’s it. It’s pretty simple and overall very similar to my normal routine. I used to not do anything in regards to preparing for a race… But when I took the time to properly rest and fuel, the difference was overwhelming. I’m not out there to win it–by any stretch of the imagination–but I am out there to enjoy myself. And I found that these simple little things can make my experience so much more enjoyable. What do you do to prepare for a big race?! The human spirit is one of ability, perseverance and courage that no disability can steal away. Years ago I was in the middle of a long run when suddenly I was struck by a question; why are there no run clubs or programs for individuals with special needs? As a mom to a child with significant needs, I’m always on the lookout for programs that will provide exercise, social engagement and opportunities for accomplishment for my child. And I worry about adulthood–what will he do for fun, to stay active, to socialize? And that’s when it hit me. Maybe I should be the one to do this…to create an inclusive run club that teaches others about the life long joy found in running with friends. But I told myself I’m too busy. Three kids with special needs, teaching classes, training for ultras, running a household….when would I do it? Instead, I spent time volunteering in the special needs community when I could. I told myself that was enough. Then last summer, my son participated in an adaptive triathlon through Vanderbilt Children’s Hospital. He loved it so much–the joy, the pride–it was overwhelming! The first thing he asked when it was over is if he could do it again next week. That’s when I knew I had to make my dream into a plan. But life happens. Hospital stays, doctor appointments, therapies and never ending obstacles riddle your life when parenting 3 kiddos with special needs. But again I was struck with a thought; how could I not want to give back to this sport that has literally saved my life? How could I put this off one more moment? Here is my chance to GIVE and share my gifts with others, so that they can, in time, do the same. So here I am, bringing my dream into fruition. I have launched an inclusive running club in Nashville for ALL ages and ALL abilities. I have big plans for this group and I’m excited to see where we go from here! Hospital, doctor, and therapy appointments that are never ending, extracurricular activities galore and well…just life stuff…has greatly interfered with my training. So I’m relying less and less on my training plan and leaning more on my own experience and trusting that I know my body best. With that said, I’ve been building volume during the weekdays and extending my long runs and back to back long runs on the weekends. I’m feeling strong, my speed has increased and my endurance is building. I’m hoping I’ll be ready in June for my 50 miler. I don’t want to just survive it, I really want to rock it out! So here are some of the things I’ve been up to these past couple of weeks. Cheers to some solid training in the weeks to come! I’m trying not to stress over things I cannot control… and reminding myself that I’m doing this because I just love it so darn much. Even if I end up DFL, it’ll be with a smile on my face! This weekend was a whirlwind of activity, which makes training for my 50 miler….interesting….to say the least. We drove through the night Friday to reach Indianapolis for my son’s cheer competition. It was a US finals competition and his team ended up placing second! We turned around and drove through the night Saturday to get back home. The next morning I decided to wake up and hit the trail for what was supposed to be a long run. I woke up to a very confused mother nature, with temperatures below freezing and very strong, blustery winds. Usually that wouldn’t be a big deal, but I was worried about my eye healing. I pressed on for 10 miles before heading back home to check on my eye. The intense, cold winds blowing in my face for that long – I just knew it was going to re-damage my corneal abrasions. Luckily, everything seems to be fine. Hitting the treadmill today after I do some housework and homeschooling with the littlest… Kicking it up a notch this week and ramping up mileage over the next few weeks. This week I have another night of bouldering league and then the Rock and Row triathlon this weekend with some friends. Going to give it all I have and make my training work this week. After successfully completing 5 ultras, I have come to realize that sometimes training doesn’t go as planned. Sometimes, you just have to know your body and know what you’re capable of–and trust that you know what your body needs to get you across the finish line. I have not been able to stick to my training plan for this upcoming race, but I am doing everything I can to get myself across the finish line. It’s a little bit of a leap of faith, hard work, preparation… and giving yourself some grace. Dam Yeti 50 here I come! The countdown is on until my 50 miler in June. Unfortunately, life keeps finding ways to derail my training plans! This past weekend, my long run got cut short when a group of guys in a truck thought it would be fun to harass me. I got a few miles in, but far from what I had wanted or needed. Luckily I also got some hiking miles in with family. I ended up scratching my right cornea–several deep abrasions over the center of my right eye. So I decided on indoor dreadmill running this week (11 miles so far) and strength training while it heals. I also made some progress at my bouldering league. But it turns out that my eye wasn’t healing properly….so rest and no activity for now! I’m hoping to try a long run on Sunday….I’ve got to get back on track. I’m already going stir crazy!! So, who else has had a crazy week? !